Note: Our son did this project about 90% on his own. Mom and Dad would demonstrate steps and then he took the reins from there. Our oldest son, who’s in 3rd grade, brought home the classic “build a volcano and make it explode” class project. This was a no-brainer to my husband, for whom recreating terrain is old hat. Over the course of about 5 days, my boys took off on the project. My husband outlined a plan, based on simple guidance from the Internet. It was great that we had absolutely everything in the house, mostly because of the model railroading supplies we had just used on our son’s model railroad that was completed late last year. The teacher offered us a recipe for salt dough, which is a popular method for making the volcanoes. Instead we chose paper mache, which is more lightweight. We started with several items that were essentially recycled: an empty soda bottle, a leftover piece of plywood for the base, a cardboard box and our old phone book. The first thing we did was spray paint the plywood with some “natural” colors: brown and dark green. Our son was able to do the painting and was tickled when we told him that a lot of this project is not precise. He’s precise about many things — chess, piano, schoolwork…but not at all when it comes to crafts. The sloppier, the better! 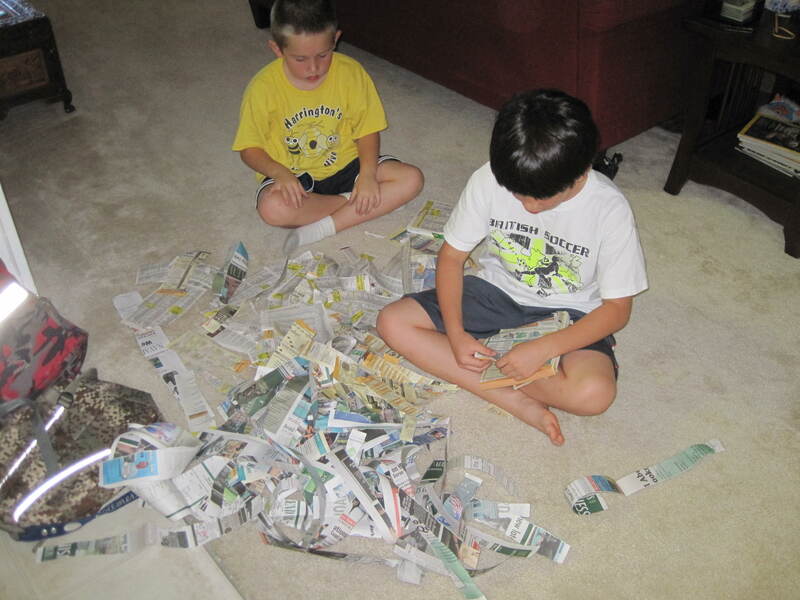 While the paint was drying, we took time to cut strips of cardboard and tear strips out of the old phone book. The cardboard would be used to make a cage around the plastic soda bottle, while the phone book pages would used with the paper mache. For the paper mache itself, we used a product that my husband had on hand called Scupltamold. It’s a cellulose product that is used routinely for model railroading. It’s incredibly lightweight. 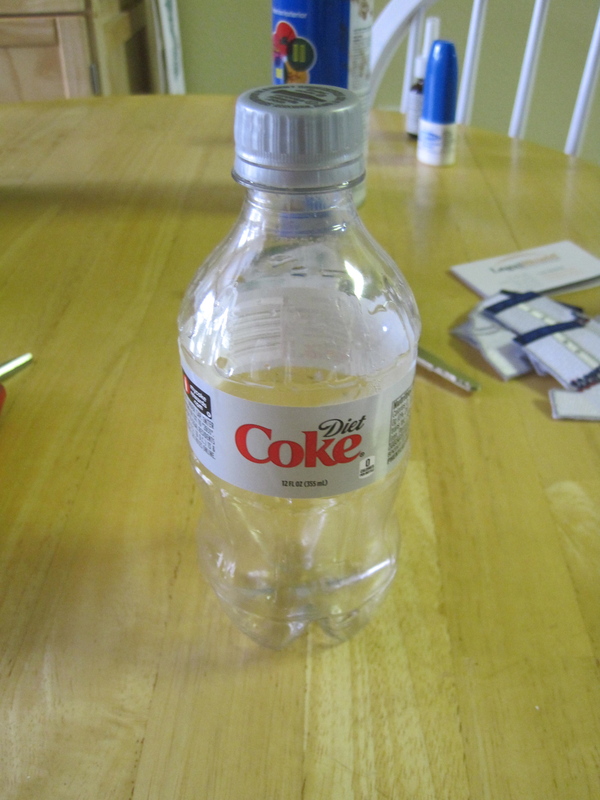 So it was pretty straightforward to make the “cage” of cardboard strips around the empty plastic bottle. We used a hot glue gun and explained to our son that he just had to criss-cross the strips and attach them with a little bit of glue. He did a great job! 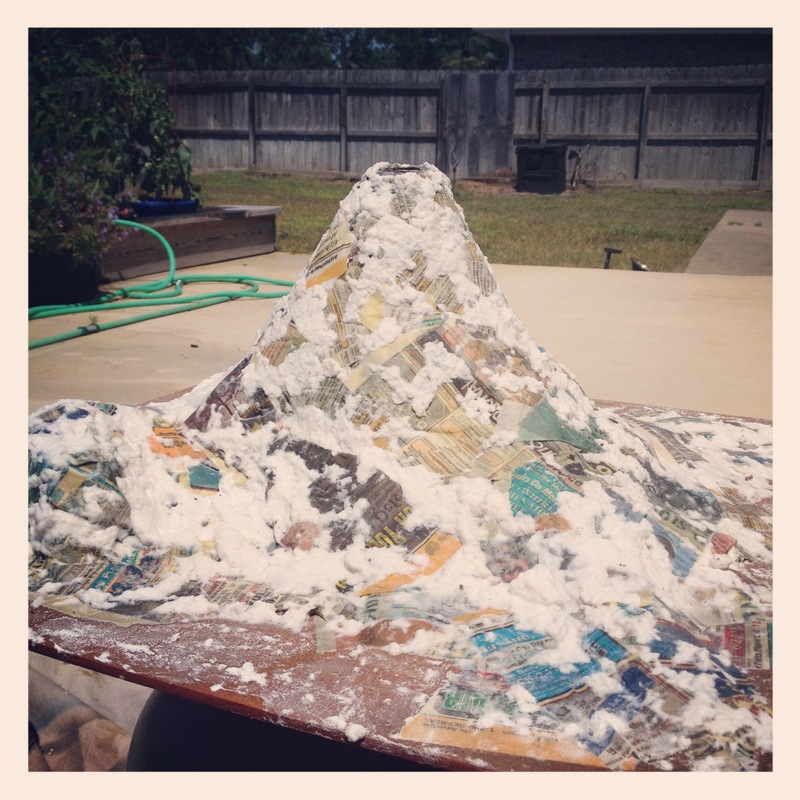 Then it was time to paper mache the volcano…unfortunately, I wasn’t on hand to take pictures of that step in progress, but with the Sculptamold and the strips of paper from our old phone book, it didn’t take long at all for the shape to come together. This was allowed to dry for about 24 hours. Then it was time to paint and “scenic” the volcano. 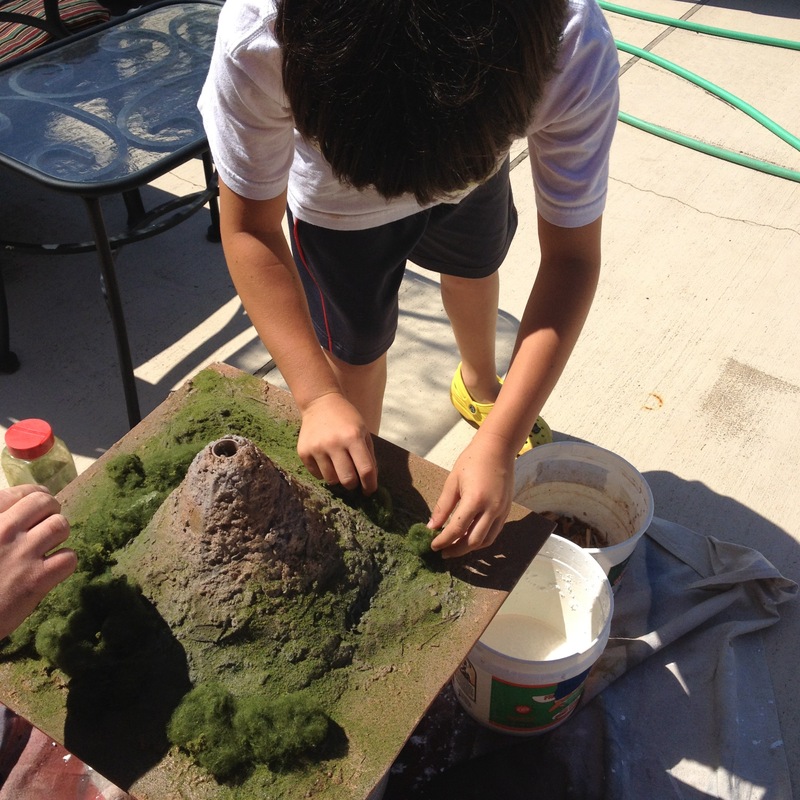 First our son painted the volcano, and then while the paint was still tacky, he sprinkled on some ground foam that will give the appearance of grassy areas. 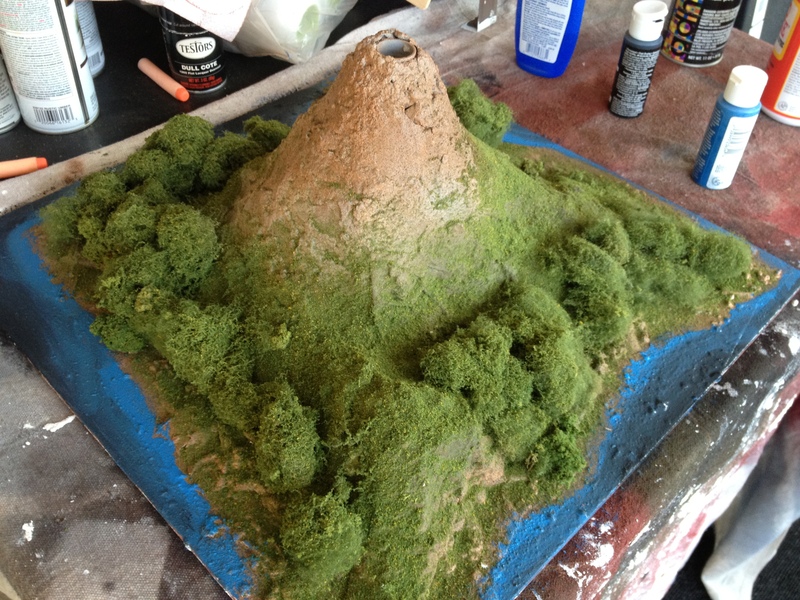 My husband had leftover trees that were cannibalized from older train layouts…those were easily glued to the base of the volcano with spray adhesive. We had all these materials in the house: from the stash of model railroad supplies. The final touch to the project was to use acrylic craft paint to color the edges of the plywood base to give the impression that the volcano was on an island. That’s essentially it…in terms of the project that was to be done at home. We allowed about 48 hours of extra drying time before the volcano — and a report featuring ten facts about volcanoes — had to be transported to school. One of the perks of using the paper mache method to build the volcano was having a very lightweight structure that our 9-year-old could carry on his own. I helped him with the doors, but he proudly carried his project into the school. In class, the volcano was subjected to the classic baking soda and vinegar experiment to simulate an explosion. Our son told us that his volcano had the most powerful explosion in the class (likely a function of the small bottle), with the exception of the student who brought in the Mentos and Diet Coke. We hope you might find some inspiration from this post when your Geekling brings home that volcano assignment. You can easily find scenic material from your local hobby store, such as Michael’s, Hobby Lobby, or A.C. Moore. 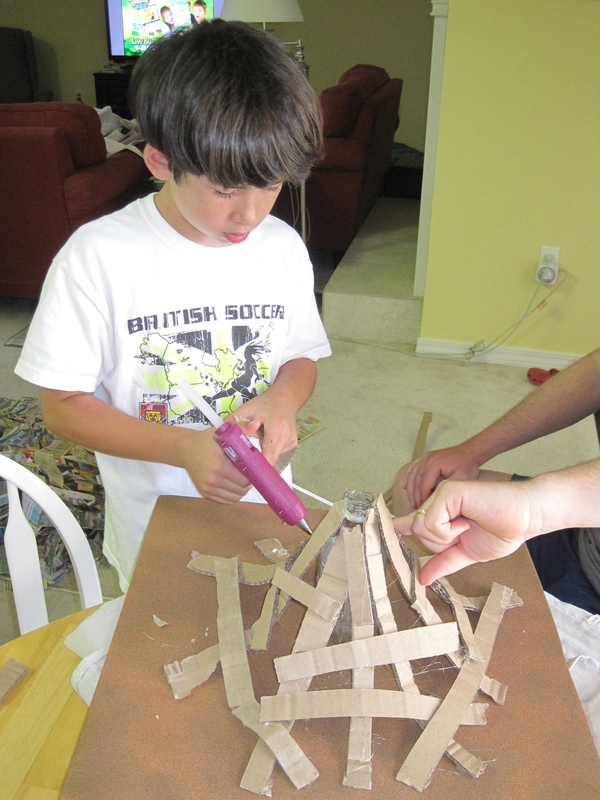 Feel free to share your pictures of your kids’ volcano projects either on our Flickr page or on our Facebook page.